and so often, the Gods, in their amusement, turned Quillios yellow. 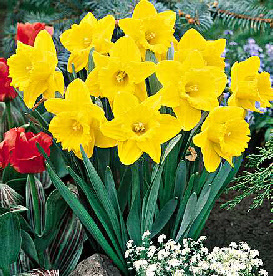 Ever since, the daffodil sends up it's long ears every spring. Even though we don't hear it, it yells with it's long trumpet as to the arrival of spring. Then as the summer becomes hot, the flower shrinks back under the earth into it's bulb.